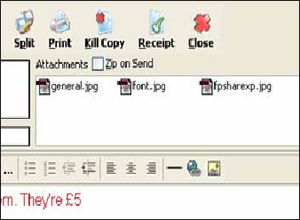 This page deals with the sending of attachments - look here for details of how to work with attachments you receive. The Internet mail system can only convey text, it will not convey binary files, such as images, sound files, word processor files etc unless they are 'attached', encoded at text. If you wish to send one or more such files with an email, press the button, and a dialog will open to allow you to search for and select the required file(s). You can select as many files as you like at once by the usual Windows method using the SHIFT or CONTROL keys. If you later want to attach one or more additional files to the same message, you can repeat the process. Alternatively, file(s) may also be dragged and dropped from Windows Explorer, onto the MailCOPA editor window in which you are working. You can also drag files from Windows Explorer onto the main MailCOPA window, and a Compose New Editor will be opened, with the file(s) already attached. It is also possible to drag file(s) onto the MailCOPA button on the Task Bar, but you must wait for MailCOPA to open up before dragging the file(s) onto the main window. Right-clicking on a file in the Attachments Pane produces a Context Menu with various options on it, including that of deleting the attachment (removing it from the message). For more details of this see here. You can set MailCOPA to zip all attachments on sending by checking the box above the attachments pane - all of the files will be placed into a single zip file. NOTE that converting attachment files to a format transmissible over the internet can add up to 30% to their size. Recipients' eamil accounts may have size limitations preventing large attachments being delivered. For large files, it is worth considering alternative methods of sending, eg FTP.